An essential trace mineral, Selenium, found in Sunflower seeds helps fight Cancer and Heart disease, while also boosting immune system, reveals latest findings. 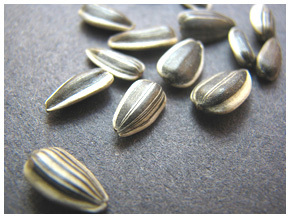 Sunflower seeds are a rich source of Selenium, which is of utmost importance to human health. Clinical trials and evidence from prospective studies on animal models of Cancer has suggested a very strong inverse correlation between the incidence of cancer and the intake of selenium. A daily intake of 200microgram of Selenium was given to ten subjects on a ten year trial conducted at seven different clinics in the US. It was found that the supplement reduced the rate of Prostate Cancer by 63% among 1312 subjects, while the incidence of Colon and Lung Cancer decreased by 58% and 46% respectively. Researchers at the North Carolina University revealed that when the influenza virus passes through bodies that are deficient in Selenium, they could mutate easily into virulent pathogens. Also, one of the most powerful antioxidant enzyme in the body, Gulthaione Peroxidase, is used by the Liver for detoxification of a wide range of harmful molecules. When this enzyme levels fall too low, the toxic molecules are not neutralized, and they wreak havoc on any cells, with which they get into contact, by damaging their cellular DNA, while also promoting the development of cancer cells. One quarter cup of sunflower seeds would provide about 30.6% of daily value of Selenium. Raw sunflower seeds are also a good source of Linoleic acid, an essential fatty acid. The seeds are also rich in Vitamin E, amino acids, and minerals such as calcium, zinc, potassium and magnesium. They also contain ˜Phytosterols that reduce cholesterol levels and are a good source of dietary fibre.